The scene at the U.S. Capitol on Monday as former President George H.W. Bush lay in state presented a tableau and a lesson for those who seek earthly power and believe it can change things. As the TV cameras panned the crowd, I was struck by how many aging "formers" there were, men (and they were mostly men) who once held high office, but now live in the political shadows. This fact should give us all pause and an opportunity to consider what truly matters in life. Washington and the media obsess about earthly power, but if it were real power -- that is, a force that could bring change for the better -- would not change have been achieved by now? Instead, we get politicians who lust for power and when they get it, squander it on fights with each other instead of using it to solve important problems that affect most Americans. While watching the coverage, I thought of something First Lady Barbara Bush said in a 1990 commencement address at Wellesley College in Massachusetts: "Our success as a society depends not on what happens in the White House, but on what happens inside your house." Earlier that same year, James Baker, Bush's closest friend and at the time his secretary of state, delivered a remarkable address before the National Prayer Breakfast in Washington. Baker said: "Power doesn't really bring the fulfillment that many say it does. Inner security and true, real fulfillment comes by faith (in God). It doesn't come by wielding power in a town where power is king." Baker, who later said he received more comments on that speech than any he has given, told a story to illustrate his point. As The New York Times reported his remarks: "He also described his sense of the fleeting nature of power, which he said was driven home to him one day when he was riding to his job as chief of staff in his sleek black limousine. Near the White House he noticed a man walking down the street alone. 'He was someone many of you would have recognized -- a chief of staff in a previous administration,' said Mr. Baker. 'There he was, alone -- no reporters, no security, no adoring public, no trappings of power -- just one solitary man alone with his thoughts. That mental picture continually serves to remind me of the impermanence of power and place. That man had it all, but only for a time.'" There were many at the Capitol ceremony who once had power, "but only for a time." Their names now begin in print and on TV with the word "former," if they are interviewed or noted at all. Few seem to care what they think now, preferring "currents" instead. In his address, Baker noted that "power can be intoxicating" and can lead to corruption. One doesn't usually hear such confessions in Washington where transparency by political leaders is rare. Moments like the ceremonies for George H.W. Bush offer opportunities for serious introspection. 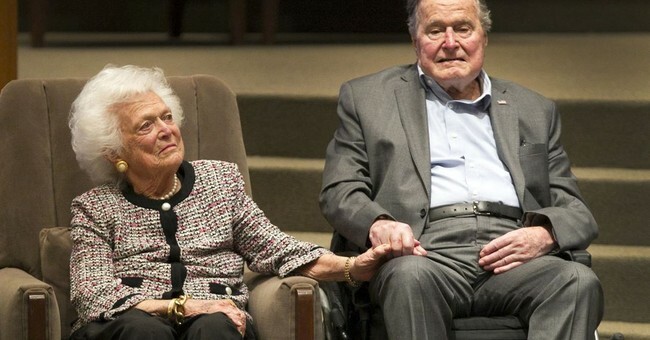 As Barbara Bush said in her Wellesley speech: "At the end of your life, you will never regret not having passed one more test, not winning one more verdict or not closing one more deal. You will regret time not spent with a husband, a child, a friend or a parent." The number of "formers" at the Capitol on Monday and the memorial service on Wednesday and some "currents" who will be formers soon enough offer a lesson worth pondering before the engines of political power fire up again. If not in politics, where does real power come from? The answer was suggested in the film, "Chariots of Fire," in which the character portraying Scottish runner Eric Liddell said, "It comes from within." It surely doesn't come from Washington, which lacks the power to fix itself.